The rugged moorlands of Black Mountain above Felindre. 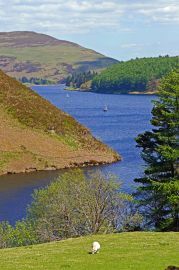 A stretch of the convoluted reservoir of Llyn Clywedog. The low hill of Moel-Ddolwen on the way to Llangadfan. Glyndŵr’s Way is a National Trail that makes a circuit around the county of Powys in mid-Wales. After walking it three times over several years, and noticing how the route changed each time, I was interested to see where it went now that further changes are likely only to be very minor. It is a remarkably quiet trail, where few other walkers will be noticed. It passes through the towns of Knighton, Llanidloes, Machynlleth and Welshpool, as well as a number of villages. The route climbs several hills and crosses several valleys, and despite being quite convoluted in many places, the signposting and waymarking is good. 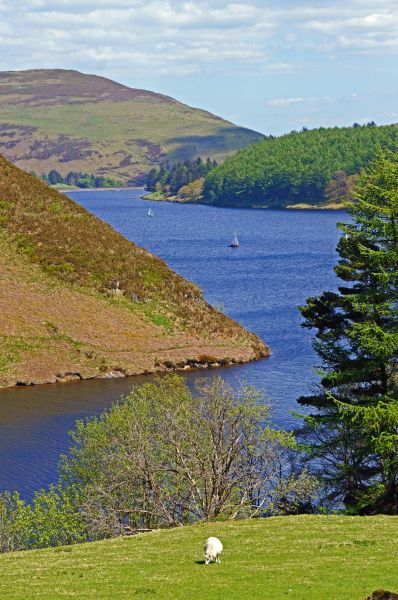 Two big reservoirs are seen from the route - Llyn Clywedog and Llyn Efyrnwy. The ruins of old castles, abbeys and mines are passed, but the chief historical interest concerns the warrior-statesman Owain Glyndŵr. He inspired a revolt and fought battles around this part of Wales, and established a short-lived parliament at Machynlleth. 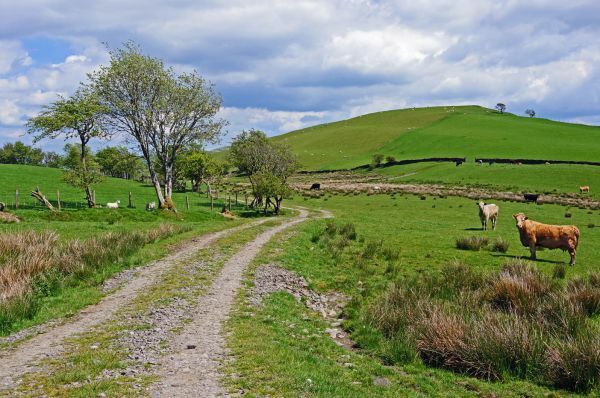 As Glyndŵr’s Way is almost a circular walk, it is easily converted into one by adding another two days of walking along the Offa's Dyke Path, from Welshpool to Knighton. So, the nine-day trail can be extended into an eleven-day circuit, and the distance can be increased from 217 to 264 kilometres (135 to 164 miles). For those who wish to see just how bleak and desolate the uplands of mid-Wales can get, there is an optional ascent of Pen Pumlumon Fawr, which takes a whole day. GPX tracks are available for all the routes in this guidebook. They can be downloaded from the Cicerone website.